we were travelling back to KL this day. so after we had our breakfast, we packed our things and checked out of the hotel. 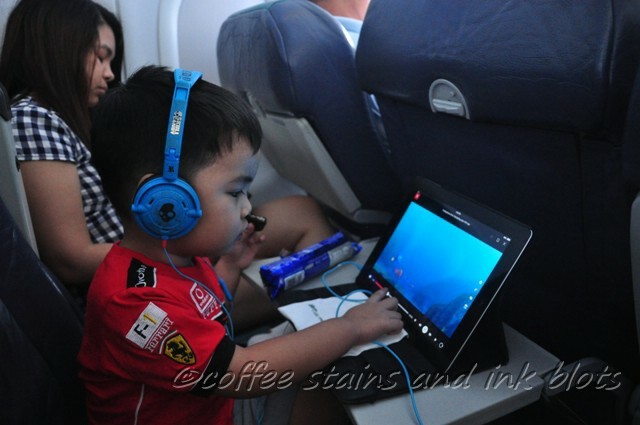 we then proceeded to senai airport for our flight back to KL via airasia. when we arrived at the airport, the check in counters for our flight were still closed so we decided to wait and eat something at old town coffee. 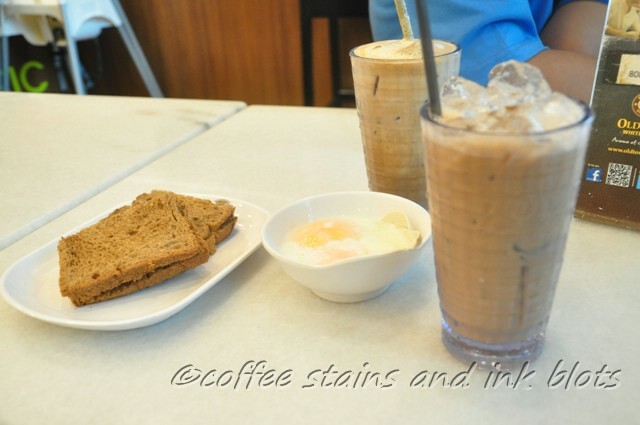 hubby had the kaya toast + soft boiled eggs and iced white hazelnut coffee while i had a milk tea. after we had eaten, we went back to the the counters. 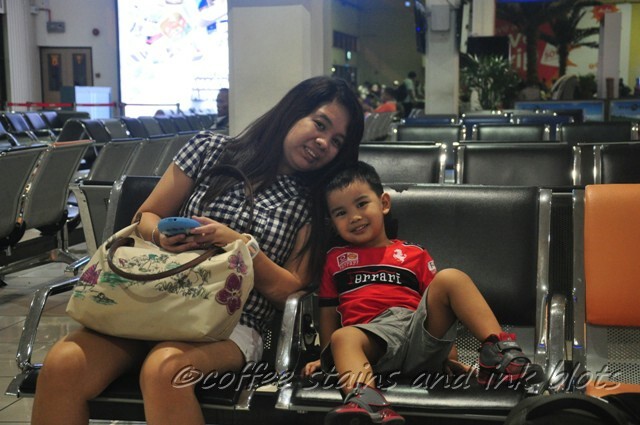 we checked-in our flights and dropped our bags, then we proceeded at the boarding gate where we waited for our flight. the flight was hassle-free, although we had some concerns with the seating arrangement that was generated by the system since one of us was assigned a seat location far from the first two. 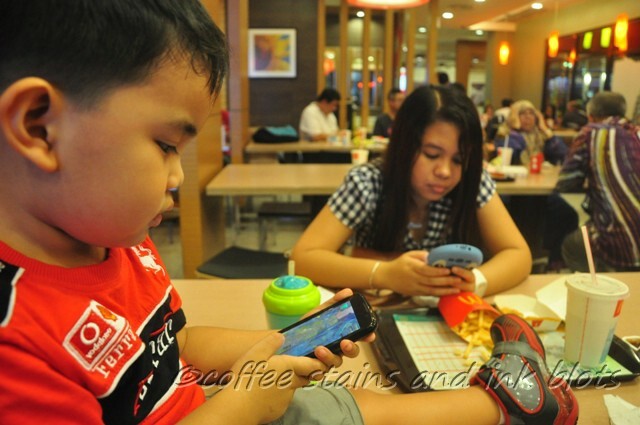 so my hubby and son were seated together and i was separated from them. 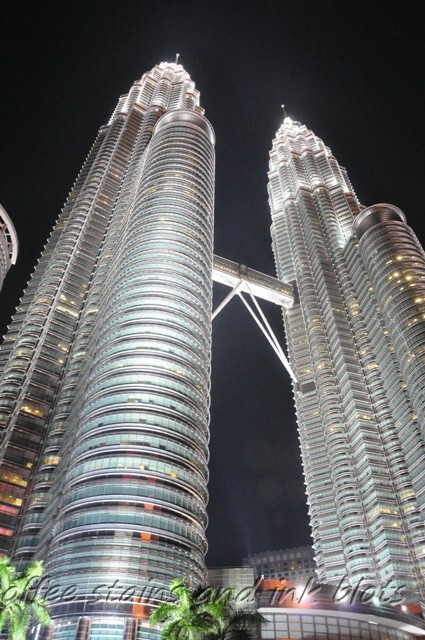 there was some delay before we got our baggage so we were a little bit pressed for time since i have already purchased petronas twin towers. after we got our baggage, we had take out food from mcdonald’s since we haven’t eaten lunch yet, and then proceeded to buy tickets for the bus ride/van transfer to our hotel. travel time was around 1.5 hours. we were able to nap a little. arriving at the city, we were then transferred to a van which would take us to our hotel. 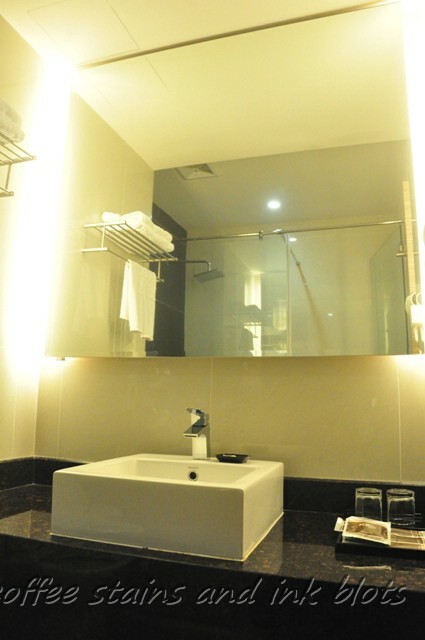 after we have settled in the room and freshened up a little bit, we went down to get a taxi that will take us to klcc. traffic was a little heavy at the city so we arrived just in the nick of time. there was already a line for our time slot, so i had to claim our tickets and proceeded to queue. when it was our group’s turn to go inside. we were first given a sort of an overview regarding the tower. it was kinda cool since the images were projected onto smoke. 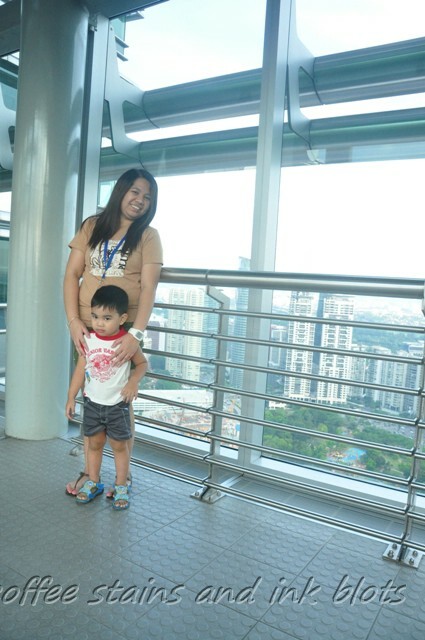 no drinks, food, and bags are allowed in the tower and skybridge so we had to leave our things except for my son’s water. 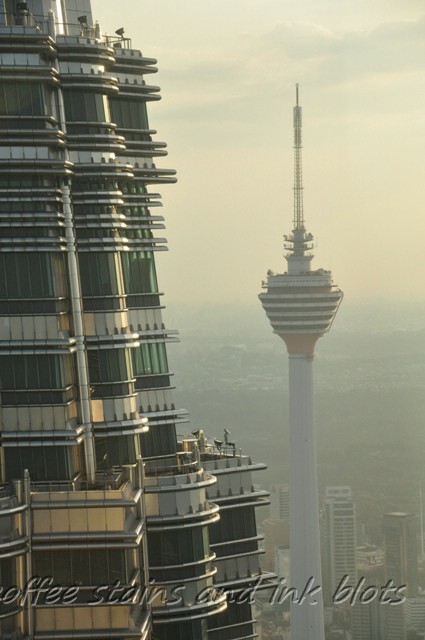 we first went to the skybridge which connected the two towers, and then proceeded to the observation deck in one of the towers. the engineering and other aspects of the towers were really great. my hubby was able to appreciate this more since he is a civil engineer. each group was given only a certain amount of time in the skybridge and the observation deck, and then you will be asked to go down. we bought some souvenirs at the shop like the towers replica, keychain and magnet. 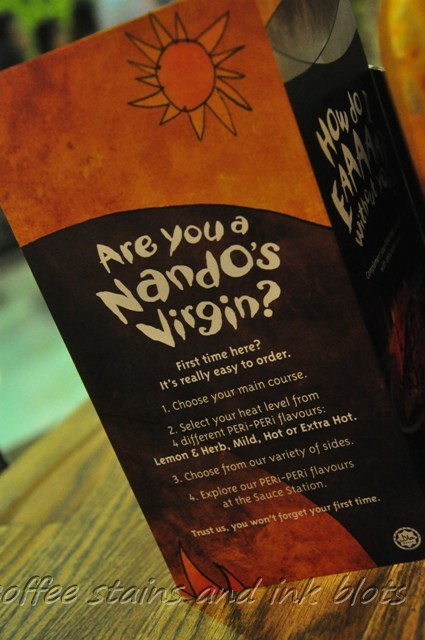 we were already hungry by the time we finished with the twin towers, so we ate at nando’s inside the klcc mall. we only ordered the “mild” chicken, but it was still a little bit spicy for my taste. nevertheless, we finished our chicken and side dishes. my son enjoyed the potato wedges that was included in our order. 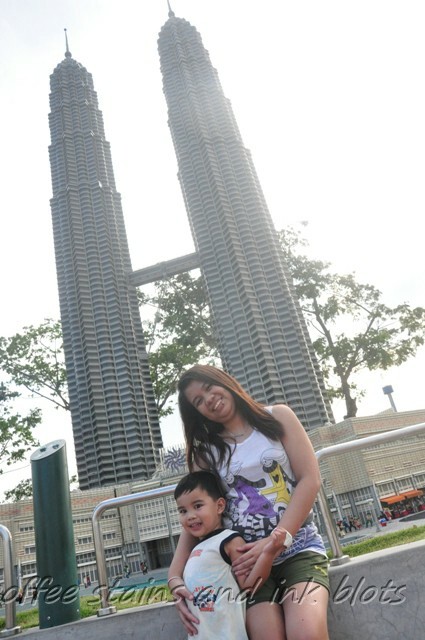 after eating, we had a small photoshoot outside where the twin towers were all lighted up. we were just on the “backside” of the tower and too lazy to go to the other side. 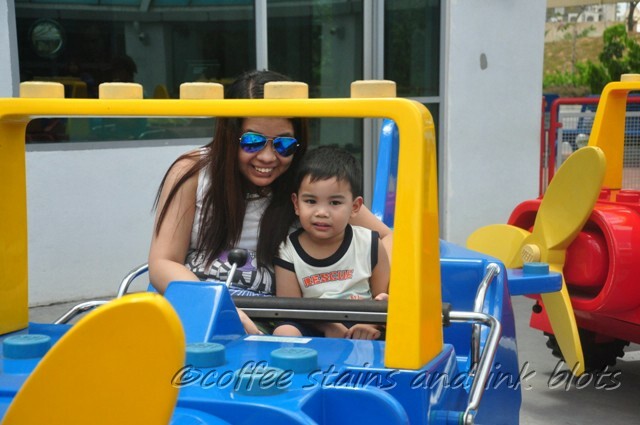 this is our legoland day. 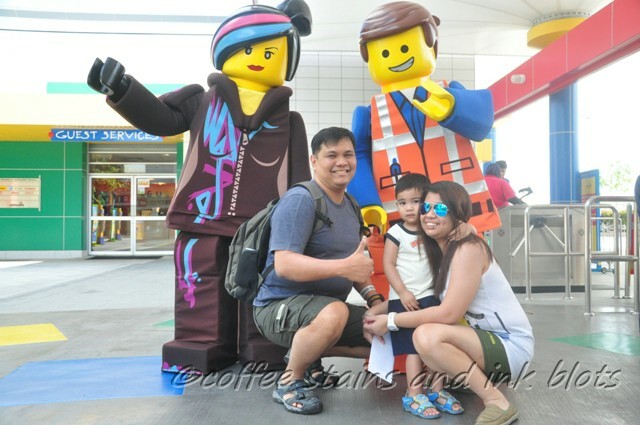 😀 we already had the hotel arrange our tickets and transportation to the legoland park. since we only had a day, we were not able to check out the water park. 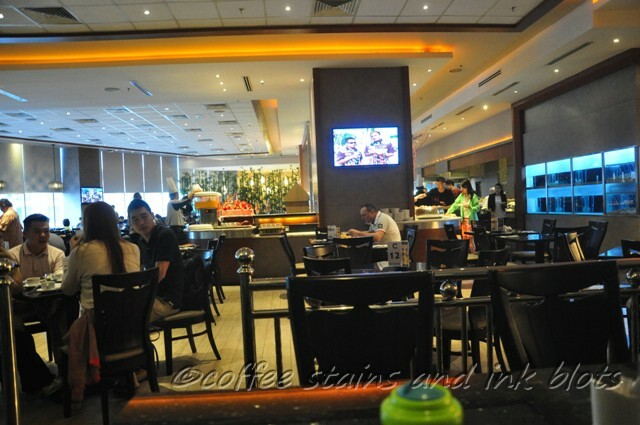 we first had our breakfast at the hotel’s restaurant which is already included with the room accommodation price. it was a buffet that served mostly malaysian food, but there was also a little bit of indian and western choices available. 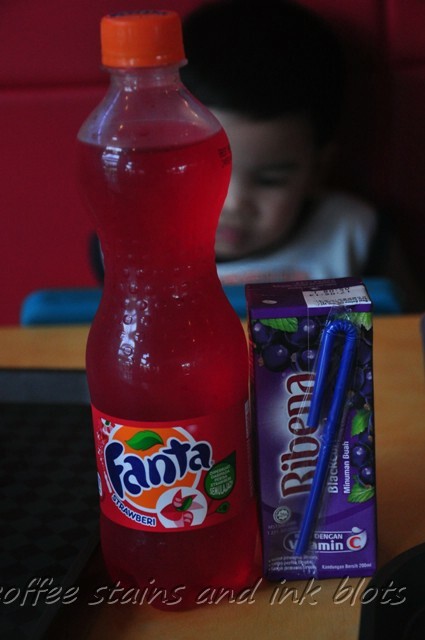 i really liked the pink guava juice that was one of the choices for the drinks. 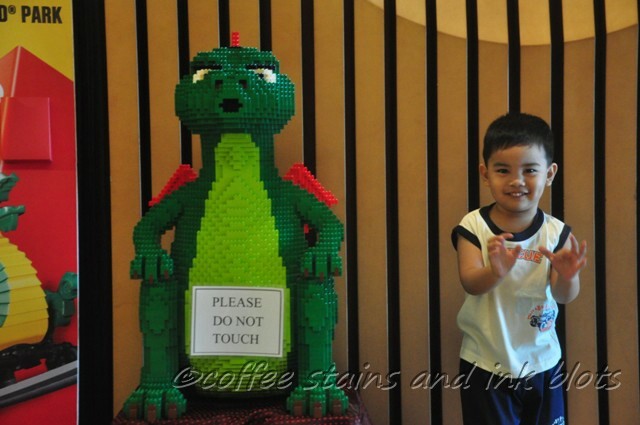 after breakfast, we lounged around the hotel lobby, took some pictures and then waited at the business lounge for our driver who will take us to legoland. 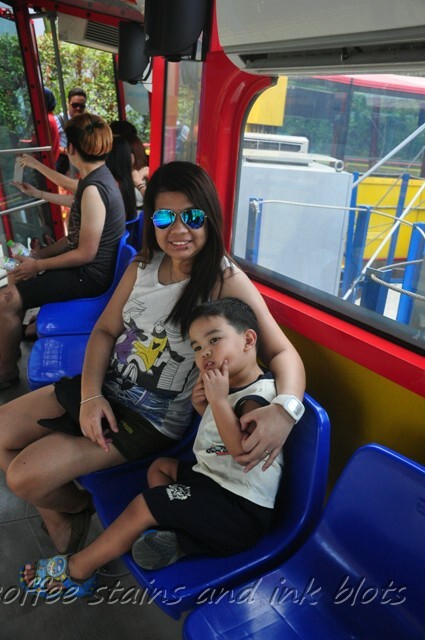 the ride to legoland was around 30 minutes. we were dropped off at the mall of medini which has several shops and restaurants you can eat at if you do not want to eat inside legoland. 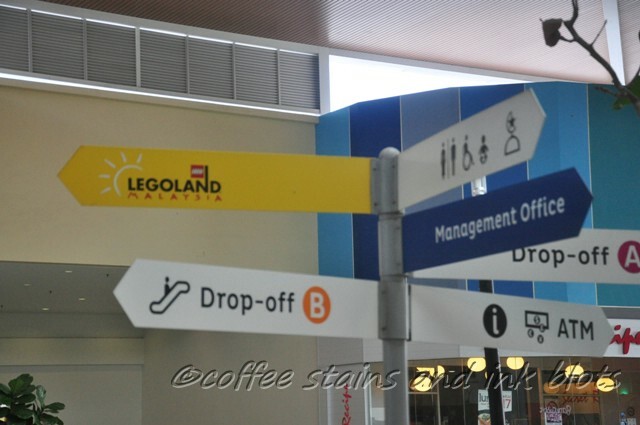 you will walk the stretch of the mall before you get to legoland’s main entrance. at the entrance and at several parts of the park, there are photographers who will take a photo of you with a great background (like the legoland entrance signage) or a computer generated one. they will then give you a bracelet which has a barcode, and you can claim you pictures later on, if you like, at the shops. 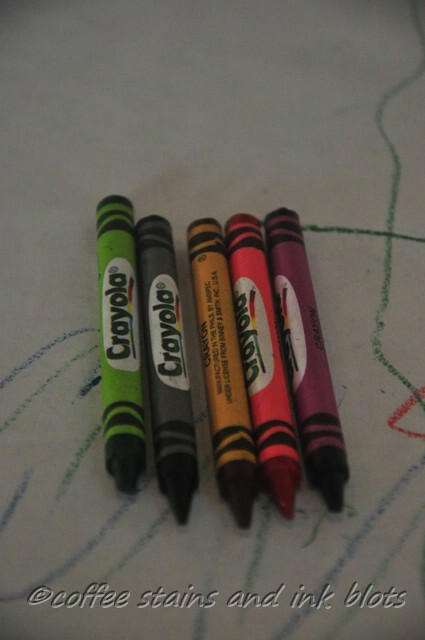 they are also kind enough to take shots using your own camera just like what we have. 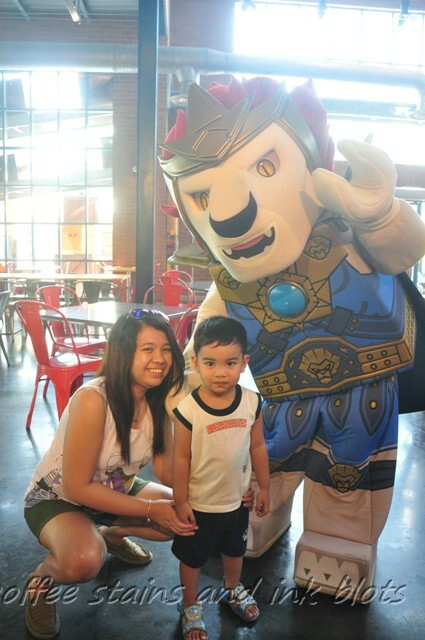 it was very hot in legoland. the trees are still small and there are some area with shade, but mostly it was hot concrete. make sure that you use sunblock and bring caps, umbrellas, sunglasses, fans and of course lots of water. 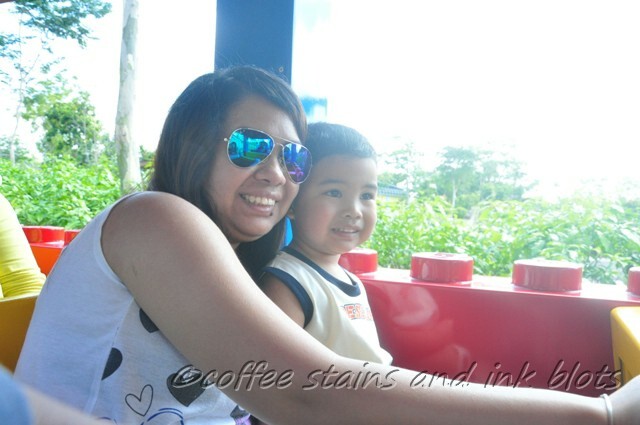 we went around the park and tried out several rides. 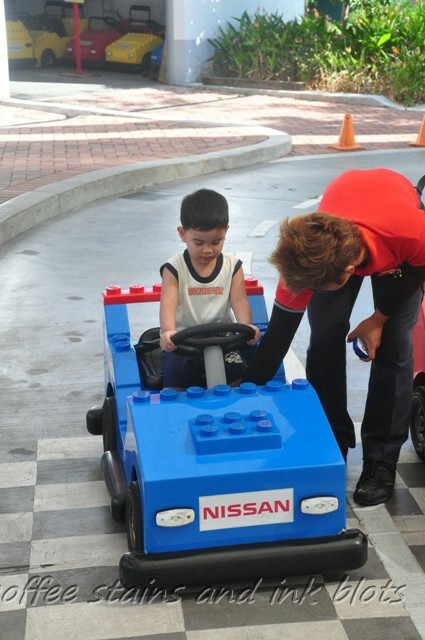 we did the junior driving school, boating school, and the legoland express. my son also spent some time playing at the shipyard. since we went on a weekday, there were just a few people and queues almost do not exist. after this,we had our lunch at the market restaurant. they have a “cafeteria” kind of service wherein you will choose the food set that you want, and then you pay for it and then bring it to your table. 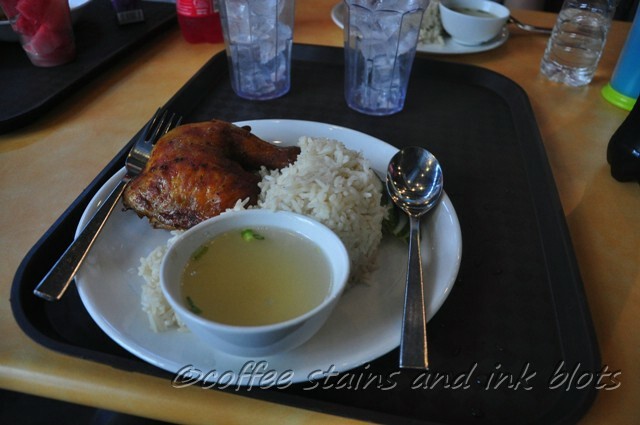 hubby and i had the chicken meal, while matteo had chicken nuggets. 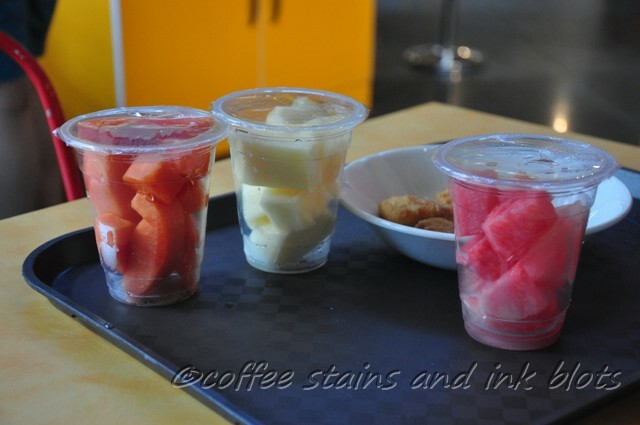 most of the meals come with a fruit cup and a drink. 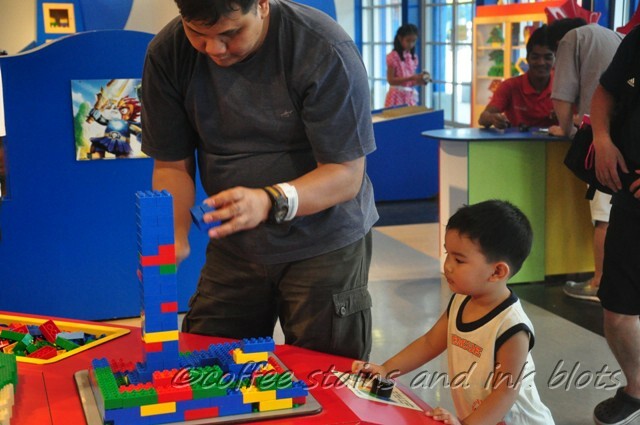 we then went to the lego city airport. 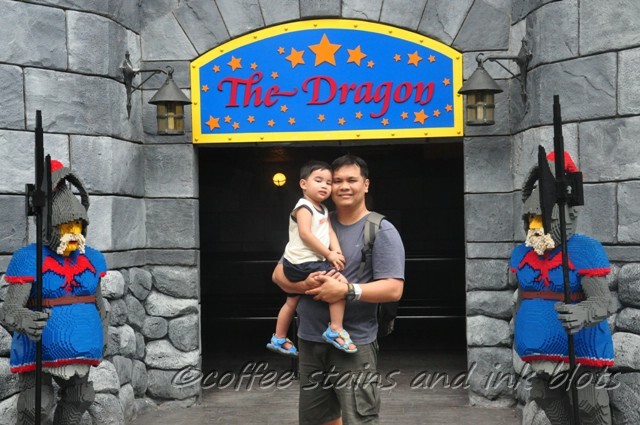 too bad that the dino island ride was under maintenance that day so we were not able to try it out. 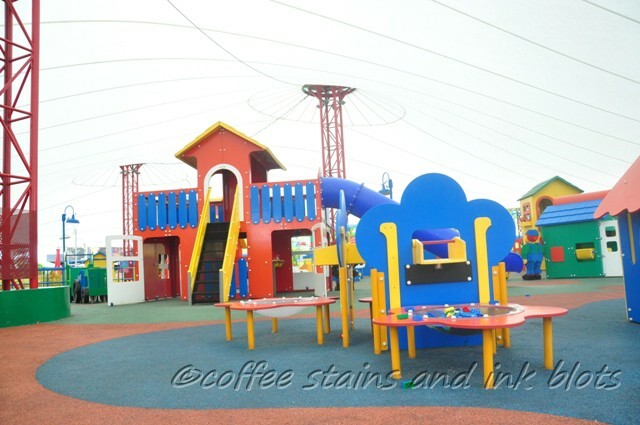 we spent sometime inside the duplo playtown where my son had a blast building things with the various bricks, running around, and playing with the slides. 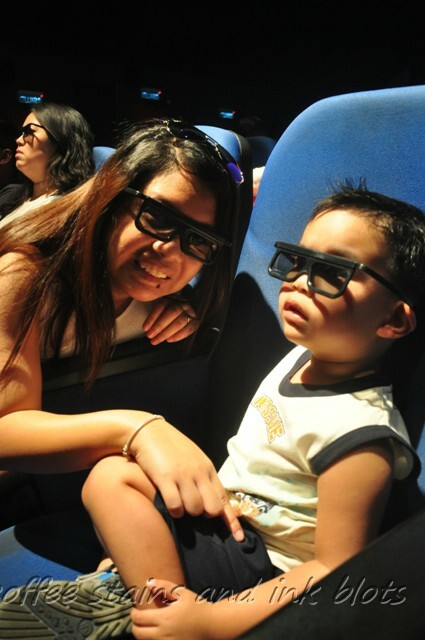 to cool off from the heat, we watched two 4d shows at the lego studio — lego racers and clutch powers. it was a fun experience for my son, especially when we were getting showers. 😉 we also tried out the observation tower which gives you a bird’s eyeview of the whole park. from the top, you could see that there are still plenty of areas for development which could mean more areas to explore in the future. 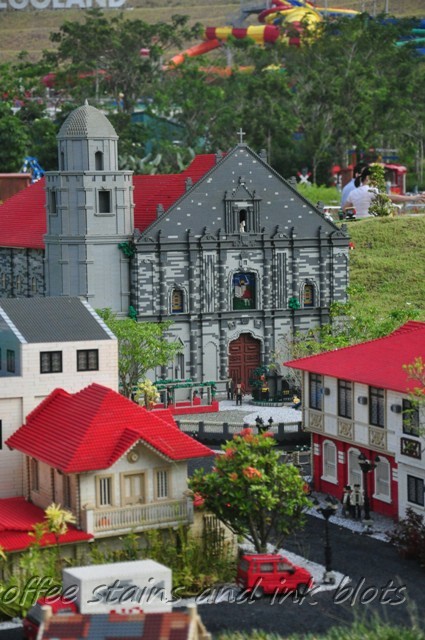 See the world in an amazing new way in MINILAND, the centrepiece of every LEGOLAND®Park. It took three years and more than 30 million LEGO® bricks to recreate some of Asia’s best known landmarks in detailed miniature.Stroll through famous scenes from 17 Asian countries, including the Petronas Twin Towers, the Merlion Statue and the Taj Mahal.The whole of MINILAND is animated, and guests – big and small – can bring the models to life at the touch of a button. we were picked up by our driver at around 6:30 pm. we went back to the hotel and just bought some take out food from the mall for our dinner. 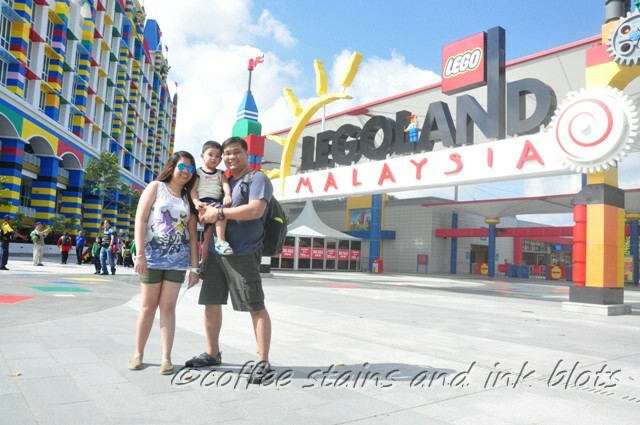 that ends our tiring but super fun day at legoland. 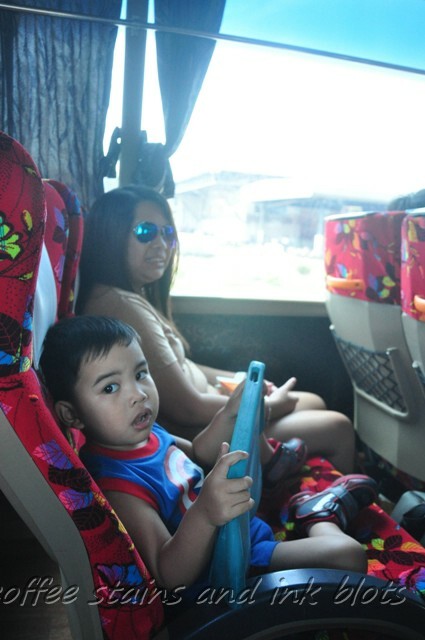 our flight to KL was via cebu pacific. the flight was uneventful, and there was just a delay in our arrival due to the air traffic at the LCCT. because we will be taking another flight to johor bahru (where legoland is), after we have cleared immigration and claimed our baggages, we proceeded to the domestic departure area. we checked in on our flight, processed our bags and then went to mcdonald’s for snack/dinner. we make it a point to eat at a mcdonald’s for every place that we go to. here in kl, they have the usual burgers and chicken. the fries and drinks that are included with a meal are large sized. they also have shakes and frostees. after we had eaten, we went around some of the stores at the terminal and then stayed at the boarding gate and waited for our flight. the wifi signal at the terminal is very strong so it makes waiting for your flight bearable. we were even able to do a clear skype call to my mom who is in philippines. after some delay, we were able to board the air asia flight going to jb. the flight was around 50 minutes. when we arrived at senai airport (which is really nice and very clean as compared to lcct), we just waited a little bit for our bags, and then we were met by someone from our hotel since we arranged transportation going to the hotel. 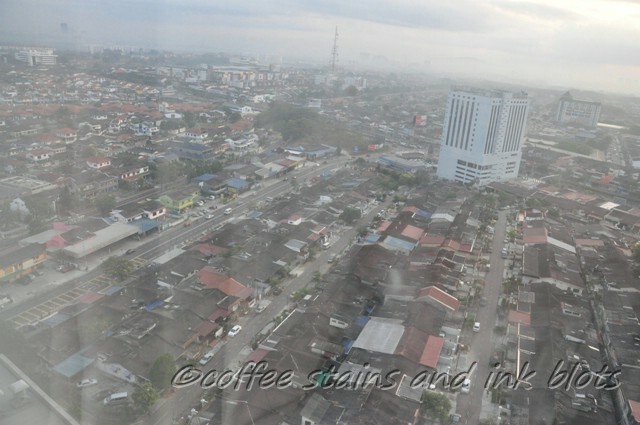 we stayed at KSL resorts in JB. 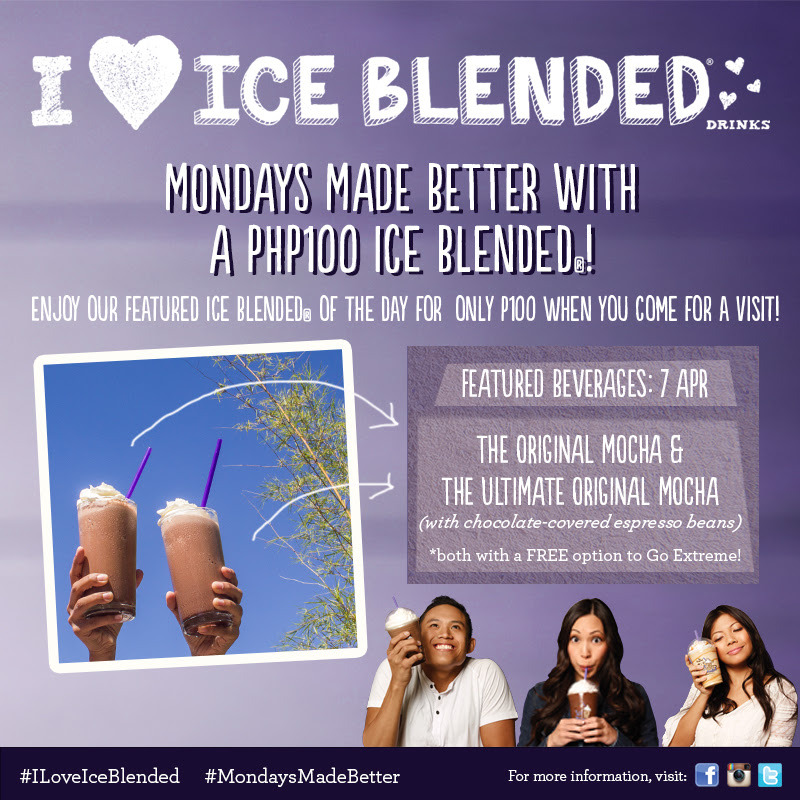 we availed of a “facebook” promo wherein there is a certain discount given to those who likes their fb page. 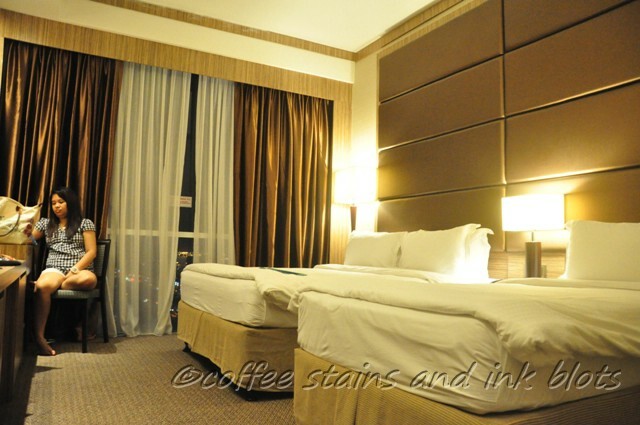 the room was spacious, with a queen sized bed + a single bed. 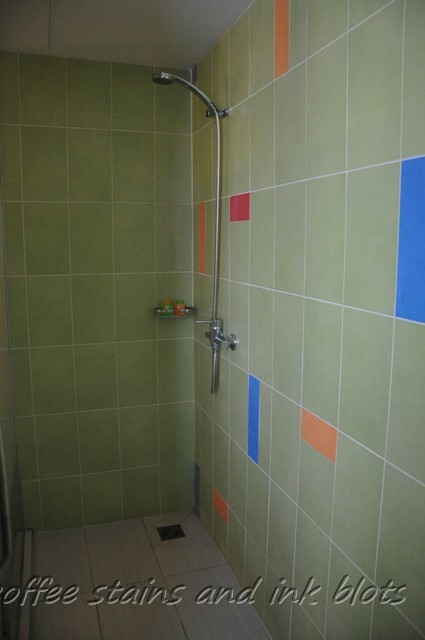 the bathroom had a rainfall shower. 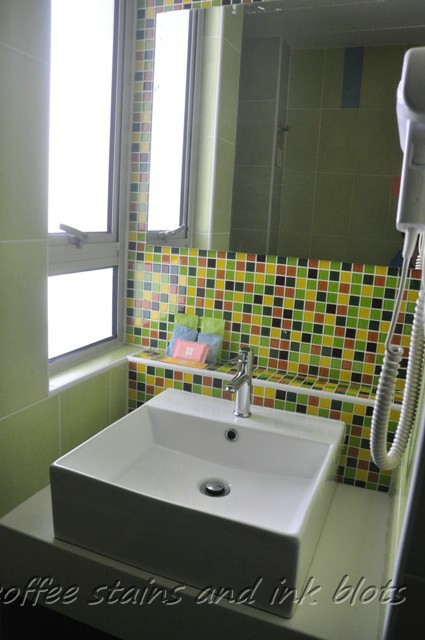 the basic amenities that one would need for their room are present. we were allowed to connect two devices to the free wifi of the hotel. 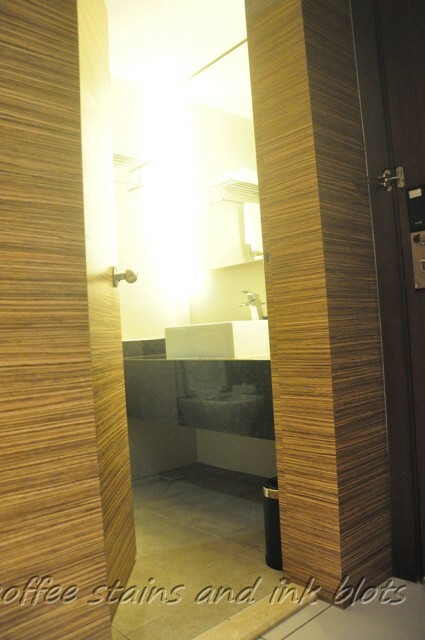 the only thing we had difficulty with was with the power outlets. we assumed that the hotel has generic sockets, but it turns out that we needed an adaptor so that we will be able to plug in and charge our devices. good thing that there was a mall at the lower level of the hotel so we were able to get one the next day. 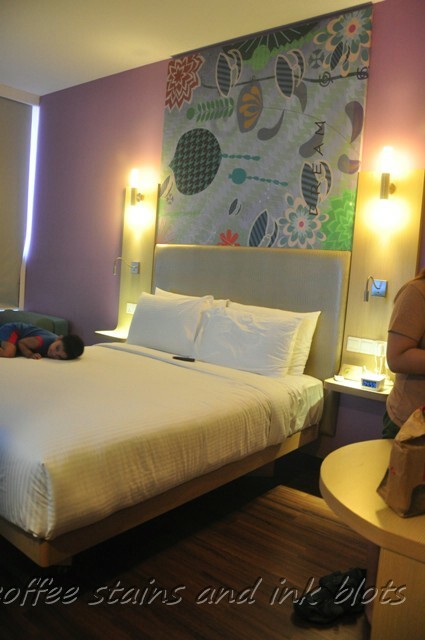 once we had checked in and settled in our room, we ordered for food as our dinner / midnight snack. 🙂 hubby had wanton noodles while i had congee. the wanton noodles was good as it had the right flavors and the noodles were still springy and not overcooked. the congee was ok too, it just needed a little getting used to since i am not a big fan of chinese congee wherein you need to put all the spices and condiments so that your congee will have its flavor. we turned in for the night and readied ourselves for our adventure the next day. 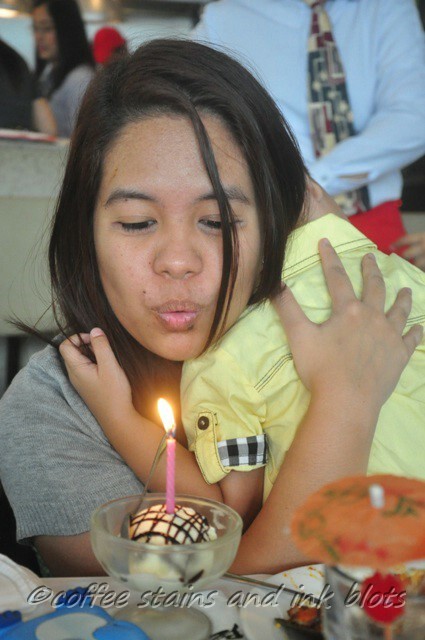 for 2013, i treated the family to lunch at burgoo. 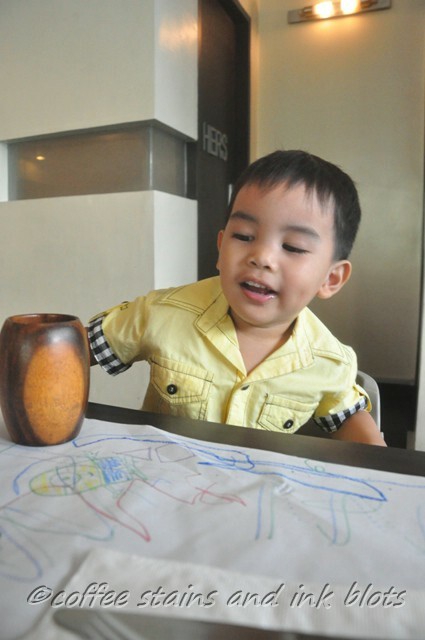 i liked dining at burgoo since they have good portions, plenty of food choices, plus the fact that my son is able to unleash his creativity at their tables. 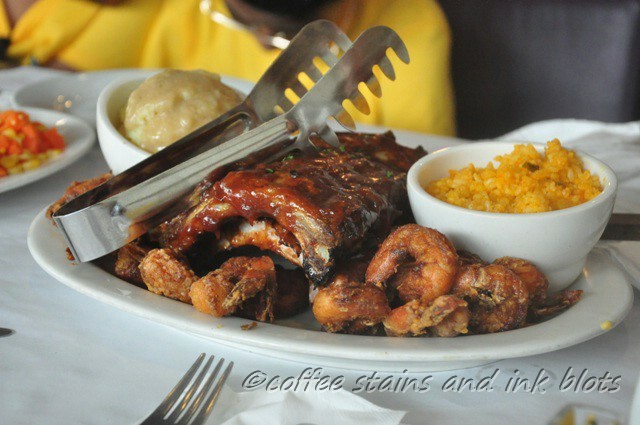 for our lunch, we ordered ribs, shrimps, chicken and seafood jambalaya. we also ordered an assortment of drinks. 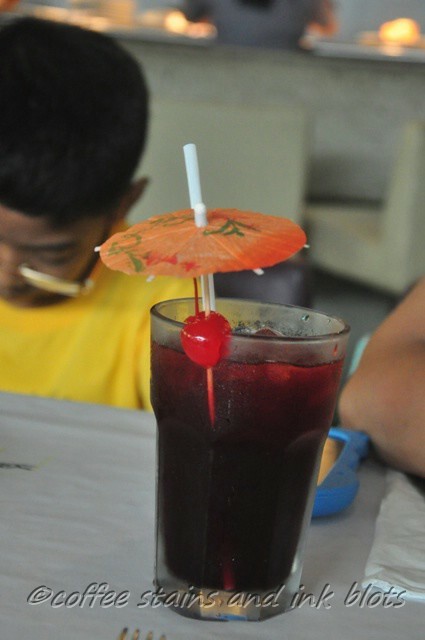 mine was the cranberry juice, while hubby had the unlimited coffee. 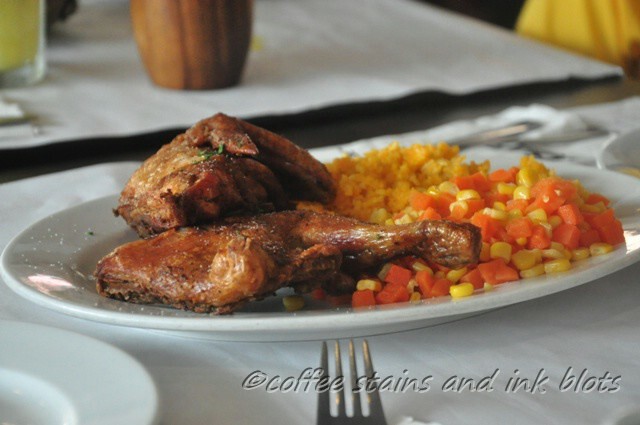 i really like the southern flavor of the food served at burgoo. the ribs were very soft and falls of the bone, plus it has a sweet smoky barbecue flavor to it. The shrimps were a little bit crunchy. This platter was served with two sides and we chose the mashed potato and rice. 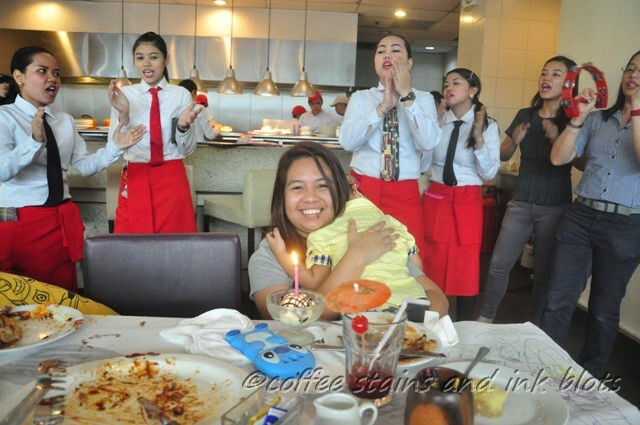 of course, just like what the others store have, since i was doing the post-birthday celebration, the staff came out with a complimentary scoop of ice cream plus a song number. 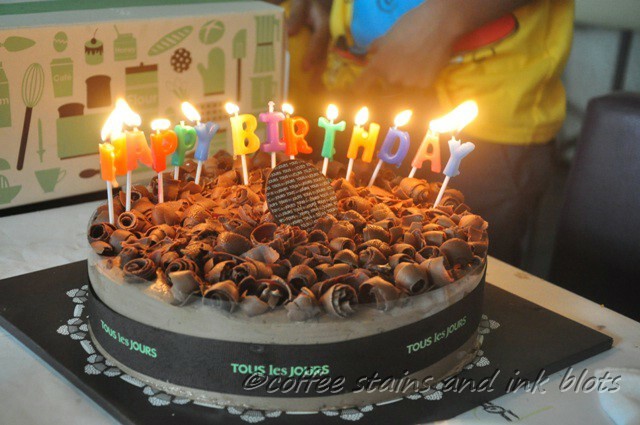 of course, i had a cake from my family (chocolate forest from tous les jours). i love the candles!